The latest advances in the treatment and management of common and complex skin diseases of the skin, both for adults and children as well as new developments in aesthetic medicine. Our exceptional faculty will present clinically relevant information that you will find immediately useful in the care of your patients. This six-day meeting provides interactive presentations, case studies, live-patient injection sessions, and multiple workshops. Learn from the experts about rosacea, acne, psoriasis, melanoma, actinic nonmelanoma skin cancers, atopic dermatitis, onycomycosis, nonsurgical facial rejuventation, pediatric dermatology-focused sessions and much more. 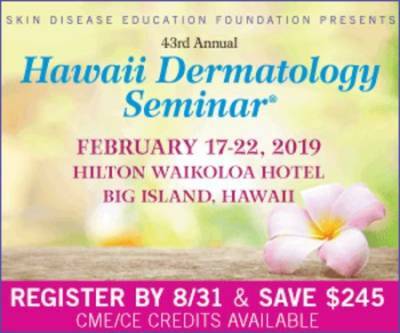 SDEF's 43rd annual Hawaii Dermatology Seminar's comprehensive agenda contains cutting edge, innovative, and evolving issues relevant to practicing physicians and health care providers who treat diseases of the skin. The scientific program has been designed to keep the clinician up-to-date with new developments within the field of dermatology. Earn AMA PRA Category 1 Credits, AAFP Prescribed credits, ANCC credits, ACPE credits as well as MOC-D.
Exhibition and sponsorship opportunities available. Please see web site for details.